Stability ball workouts are an entire exercise session on a stability ball. 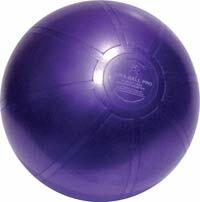 A stability ball or Swiss ball is considered the best exercise ball by some. People who have never used stability balls before may be skeptical to the idea that you can get a good workout with just a Swiss ball. 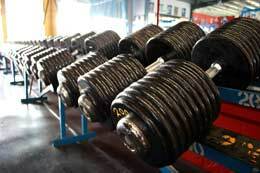 These people would most likely be experienced “old school” weight lifters who have the mindset that if their not using triple digit weighing steel weights the workouts are not effective. Stability ball exercises have a place in any exercise program and a good stability ball workout can be performed at home, in the gym or even outdoors. A workout is a full exercise or training session is a certain amount of time. During the time you workout, your exercise selection should be determined by which exercises are best for achieving your fitness goals. If stability ball workouts are going to be effective for you, you should write down your specific goals. In order to determine the most effective workout for your time you must have a reason for working out in the first place. Goal setting is very important as it will eliminate wasted time due to performing an ineffective exercise selection. If your goal is to lose a very small amount of weight (tone up), strengthen your muscles slightly, strengthen your stabilizers or strengthen your abdominals and core, then stability ball workouts may be all you need. If you have significant goals such as gaining 20 pounds of muscle, losing 20 pounds of fat, becoming a powerlifter or just increasing your strength dramatically, a stability ball alone will not do it. Stability balls are versatile and can be used by themselves for a total stability ball workout or they can be used in conjunction with other pieces of equipment or body weight exercises which require no other equipment other than the Swiss ball and your willingness to perform exercises on it. Click here for some of the best stability balls. If you want to perform an entire workout with exercises which involve the stability ball for whatever reason, you can do so. You can also use multiple stability balls for some exercises. There are stability ball exercises for most of your body’s muscle groups. You can perform groups supersets which is doing 2 exercises back-to-back with no rest in between for one set. Performing supersets and even larger sets with little or no rest are easy to perform with the stability ball. Since every exercise is being performed on the ball, you never have very far to go so you have little excuse for rest. If workouts with just the stability ball are designed properly, you will not have to stop to rest very often because you will be working opposing muscle groups. “Supersetting” opposing muscle groups together allows you to recover one body part while you exercise the other. An example of an exercise set which uses body weight exercises along with stability ball exercises is on the right. Stability ball crunches and rotating down to the floor for push-ups is a great way to work your chest, abdominals and transverse abdominis (core) at the same time. If you do not have access to any other equipment and want a great workout you can create one on a stability ball which involves body weight exercises off of the ball. Since you are using your body weight as resistance with stability ball exercises, it makes little sense to limit yourself to exercises on the ball. Stability balls are great, but during some situations in your workout a body weight only movement may be the best exercise to use. You can also superset a stability ball exercise with a floor exercise which works the same body part. For example, push-ups on the stability ball or 2 stability balls are far more difficult than push-ups on the floor. To work your chest muscle group very hard you can perform a set of stability ball push-ups to failure and immediately transition into floor push-ups until you cannot perform another rep with good form. An example of part of a stability ball workout in the gym or at home would be the dumbbell stability ball chest press (right). It is a great exercise because it helps build stabilization strength as well as work additional muscles such as the core, glutes and quads while concurrently working the target muscle group. Workouts in the gym or your home gym with other equipment are tremendous. You may be bored with your current workout or simply want to experience the benefit of stability balls. Workouts with a Stability ball along with dumbbells, barbells, cables, tubes and any equipment which is available to you can be some of the most effective and fun workouts you could do. This holds true for athletes, bodybuilders, novices, beginners and expert personal trainers. Any exercise which can be performed on a weight bench, can also be performed on a stability ball. With knowledge and imagination you can create a great the best workout for your specific goals by utilizing the stability ball along with a variety of gym equipment. What are some Good Stability Ball Workouts? For more information about workouts and custom workout programs for your specific goals check out the Workout Routines page. It is important you know the anatomy of the core and have strong enough base core strength before you perform stability ball workouts. Learn some stability ball exercises for the entire body. Learn more about why a stability ball may be your best friend when it comes to accomplishing your fitness goals whether you use stability ball workouts or not. Click on the anatomy guy and find exercises and the detailed anatomy, physiology and kinesiology background.